The CDG, through its Executive Committee, keep in touch and attend both the West Yorkshire Area Cricket Council and the YCB Council which links grassroots cricket to the work of the YCB. Minutes or Notes of these meetings are circulated to all member clubs on a quarterly basis to keep our Clubs in touch with how Yorkshire Cricket is being developed and key information available. The next meeting of the Bradford West CDG will be on Thursday 21st September 2017, 7:30 at Zara Sports Centre. Items for the Agenda are welcomed. Standard items will include: The Latest News from the YCB, a Cricket Education Update and Planned Courses for the Close Season, News from the Clubs in our area and any support which is required. Election of Officers - Shiv Krishan was re-elected as Chair of the Group and David Allen as Treasurer. Ed Duguid, the Group's Secretary, stood down from the Group after 11 years of service. Those present thanked Ed for all his work. It was decided, in view of the amount involved in the Secretary's job, that a review would take place of what was involved and it may be that some payment would be made to a willing volunteer if no-one had the time to devote to the role in the meantime. It was fully understood that everyone was very busy with their own Club matters. Report from the YCB - Steve Archer had been unable to attend the meeting, but Ed had forwarded the latest news from the YCB. (Click on this link to see Steve's Report). Mark Jobling who was present also updated everyone on the latest position with the "All Stars" initiative and Chance to Shine in case anyone further wanted to involved. News items in Steve's report included; The NEW ECB Innovation Fund, Seeking nominations for the OSCAS, New initiatiuves for Women's and Girl's cricket, a NEW Disability Hub at Bckfoot School and the launch of the new Online system for running Clubmark. Educational Courses - Shiv reported on the success of the 1st Aid and Safeguarding courses held at Steeton CC and asked members to think about what else they would like to see run by the CDG in the coming autumn, following the cricket season. Reports from the CDG's Clubs - There were reports from all the Clubs present about their actvities and developments over the last six mionths or so. Notable amongst these were reports from Steeton, Bingley Congs, Haworth, Tong Park Esholt and Sutton in Craven regarding a variety of upgrades to their facilities, with other clubs in the Group also making good progress with their development plans or indeed planning to make progress in the near future! A more detailed note on Clubs may follow in the near future. The Quarterly Report from the YCB - News on latest National Cricket Initiatives, Funds, etc. Full Report of Meeting to follow soon! 8 Clubs attended and key issues covered were: Clubmark Accreditation, Small Grants scheme awards, new "All Stars" Cricket Programme launch, Drop-in" event feedback, update on latest courses run by CDG, including Safeguarding, 1st Aid and Coaching Courses, progress with new website, Club Development Reports. Dates of our future meetings will be published shortly. Haworth CC has some old, second-hand scorebox numbers no longer needed. There are three small 12" boxes that have 10" numbers up to 12, look tatty but the mechanisms and numbers are all good and work very well. We also have an assortment of 18" boxes and numbers which are 15" high. The boxes mostly don't work but, knowing how bad it is when the half numbers crack, we thought there may be a club in need of spares? 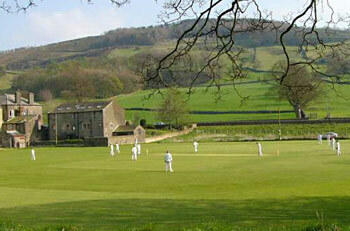 Free and Collection only from Haworth CC ground - Please contact Kath Gower on 01535 642965 before Friday 7 April. On Wednesday 15th a Drop-in Event took place at Sutton CC. Clubs from the area decended to meet members of the Yorkshire Groundsman Association, Association of Cricket Officials, the YCB's Coach Ediucation Team, Community Coaches and Cricket Development Manager as well a Kit and Equipment suppliers, Total Play and MC Sports from Skipton. Those who attended said they had learnt a lot from the experience and wanted the Cricket Development Groups from Bradford and Craven to put this on on an annual basis so Clubs could meet key support services and suppliers to see what was available to support their Clubs. We will certainly intend to do this as a regular pre-season event in future, both in the Craven area and in Bradford! Latest Events, Courses & Meetings of Key Cricket Bodies - Click on Events! New "ALL STARS" Cricket - Getting kids into the game! Here is the link to the “All Stars” Presentation (slides & video) held at Edgbaston. The one for Yorkshire was held at Elland Road recently. It is the ECB's flagship new approach to bringing cricket to the next generation. The presentation is just under an hour so you need to set aside plenty of time to view and listen carefully. Please encourage whoever is in charge of your Junior Cricket to view this. This is the way forward that the ECB and the County Boards (including the YCB!) will be putting their funds into! You and your Club members probably want to see this before taking any decisions about your club's future. NEWSFLASH - "DROP-IN" EVENT FOR ALL CLUBS IN MARCH! Bradford West and Craven CDGs are jointly organising an Event on Wednesday 15th March from 7 pm onwards at Sutton Cricket Club, which Clubs can literally "drop-into". There will be a wide range of Cricket Suppliers, from Insurance to Groundworks, to Trophies and all the Cricket support bodies from the Coach Education to Senior & Junior Cricket Leagues, the Association of Cricket Officials covering Scorers and Umpires, the Yorkshire Groundsman Association and much much more. Hopefully there will be something for your Club that will help you get or find out about something you need for your Club. And the YCB Cricket Development managers for both West and North Yorkshire will also be on hand to answer any questions you might have. So, stick in in your diary now. For a couple of hours investment you might just find out something of real value to your Club! As we get more information abot who else will be at the Event we will update this website for you.